Not all greenhouses are built the same and the Monticello line of greenhouses by Riverstone Industries proves this to be true. Constructed from the highest quality extruded aluminum (US grade) and electrostatically painted Black (containing 0.0% lead), our greenhouse uses on average more than 40 lbs. more aluminum than the average imported greenhouse. Why is this important? The weaker the framework the less snow the greenhouse can hold in the winter time before collapsing and the easier it is to get damaged by the wind. While most hobby greenhouses use less expensive thinner walls and roofing materials, the Monticello uses professional grade 8mm twin wall polycarbonate. This acts as a double pain window keeping cooler air in during warm months and insulating the greenhouse from cold air in the wintertime; making the Monticello more efficient to grow in for a longer period of time and adds to the efficiency of growing. The Monticello 4 foot extension Premium kit is specifically designed for the Monticello line of greenhouses. The idea is simple, as your gardening greenhouse needs grow so can you greenhouse. The 4 ft extension kit allows for the expansion of your greenhouse. The design and installation is simple. Each 4ft extension kit comes includes a 2ft x 2ft roof vent with automatic opener and gutters. When ordering your extension kit make sure that the colour matches your existing greenhouse. This one is designed specifically for Black frames and will work with the following greenhouses: MONT-8-BK-Premium, MONT-12-BK-Premium, MONT-16-BK-Premium, MONT-20-BK-Premium, MONT-24-BK-Premium. The Monticello 4 ft. extension kit is specifically designed for the Monticello line of greenhouses. The idea is simple, as your gardening greenhouse needs grow so can you greenhouse. The 4 ft. extension kit allows for the expansion of your greenhouse. The design and installation is simple and takes under 2 hours to assemble. Each 4 ft. extension kit comes includes a 2 ft. x 2 ft. roof vent with automatic opener and gutters. When ordering your extension kit make sure that the colour matches your existing greenhouse. This one is designed specifically for Black frames and will work with the following greenhouses: MONT-8-BK, MONT-12-BK, MONT-16-BK, MONT-20-BK, MONT-24-BK. Here comes the gardens Bella! 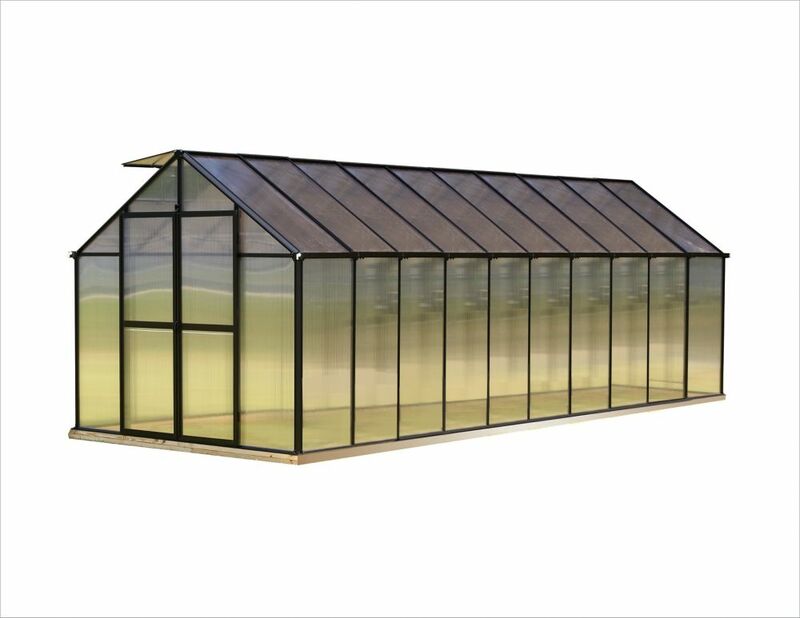 This beautiful and practical 8 wide greenhouse features virtually unbreakable Twin-Wall Polycarbonate panels, creating an ideal combination of sunlight diffusion, heat insulation, and safety for all your gardening needs. The large workspace and the wide double doors allow the most avid gardener plenty of room to grow an abundance of vegetables and herbs and still have room for transplanting tender plants, and for storing tools and accessories. The bell shaped greenhouse was specifically designed to improve wind resistance and allow snow to easily slide off. The Bella is a strongly built, attractive greenhouse; it will offer you years of gardening enjoyment. This greenhouse also includes a galvanized, rust resistant steel perimeter base for additional structural support, stability & alignment. 8 ft. X 20 ft. Black Greenhouse - Premium Package Not all greenhouses are built the same and the Monticello line of greenhouses by Riverstone Industries proves this to be true. Constructed from the highest quality extruded aluminum (US grade) and electrostatically painted Black (containing 0.0% lead), our greenhouse uses on average more than 40 lbs. more aluminum than the average imported greenhouse. Why is this important? The weaker the framework the less snow the greenhouse can hold in the winter time before collapsing and the easier it is to get damaged by the wind. While most hobby greenhouses use less expensive thinner walls and roofing materials, the Monticello uses professional grade 8mm twin wall polycarbonate. This acts as a double pain window keeping cooler air in during warm months and insulating the greenhouse from cold air in the wintertime; making the Monticello more efficient to grow in for a longer period of time and adds to the efficiency of growing. 8 ft. X 20 ft. Black Greenhouse - Premium Package is rated 4.0 out of 5 by 4. Rated 5 out of 5 by SeanF from Very sturdy build once it's done. We had a really bad storm last night and it came through unsca... Very sturdy build once it's done. We had a really bad storm last night and it came through unscathed. There are a couple of times when you will need two people to assemble. It took me two weeks off and on to get it done. The instructions are decent using mostly pictures. Make sure you use the 23" spacer when putting up the columns or it won't fit correctly and you'll have to redo the wall again. The premium kit is nice with a sun shade, sink and automatic watering system. Definitely recommended for wind resistance. One piece was defective (a vent) and the company immediately shipped me a replacement. Rated 1 out of 5 by Carl from Horrible product. Fell down the first year and manufacturer blamed it on install, but send me a ... Horrible product. Fell down the first year and manufacturer blamed it on install, but send me a new one. This year. I hired a professional contractor this time. Still blew down. Winds are bad here in Colorado, but the soft aluminum will bend and makes the frame fall apart. Horrible and the wind rating is an outright lie in my opinion based on it falling apart. Rated 5 out of 5 by Steven from More than a weekend project to put together correctly but... More than a weekend project to put together correctly but when you are finished, its beautiful and functional. Roof vents are tough to put in and keep in. might add a set of hinges just so they stay put. Rated 5 out of 5 by Christos from Greenhouse went up quickly and easily. Did take a whole weekend through prep and assemble which w... Greenhouse went up quickly and easily. Did take a whole weekend through prep and assemble which was longer than we thought it would take. Really like the watering system. Helps to make sure our plants dont dry out from the hot sun when we are not there. We are on a windy bluff and for the past 7 months the greenhouse has done great with no problems. Very sturdy.